It is 1933 and Detective Sergeant David Llewellyn is responsible for arresting a mad doctor who is charged with kidnapping, killing and cannibalistic-ally eating portions of various young women. Following the successful arrest and prosecution the doctor is not hanged as was the punishment then but sent to an asylum for insane people. David Llewellyn is promoted to Detective Inspector and in 1944 he is stationed at Scotland Yard. 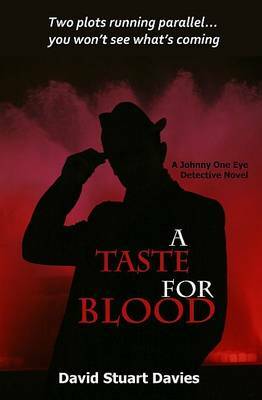 Johnny (One Eye) Hawke is a private investigator who used to work as a policeman with David Llewellyn but since he was accidentally injured with a rifle and lost an eye has not been able to serve in the forces or the police. DI David Llewellyn is investigating the chilling crimes of a top psychiatrist and his scheming patient who the doctor believes has knuckled under his authority. In the meantime, Hawke is on the case of a mysterious suicide in Edgware Road...soon discovered as not your average suicide. Soon one case is wrapped up and the two detectives are able to pool their talents on the deduction of the final one but the reader is obliged to read the book to find out how. This was a very engaging historical mystery set during the second world war and is the author's fifth novel featuring private detective hero, 'Johnny Hawke'. He has written another five novels featuring Sherlock Holmes as well as several non-fiction books about the Baker Street detective including the movie volume Starring Sherlock Holmes. As well as being a committee member of the Crime Writers' Association, and editing their monthly magazine, 'Red Herrings', David is the general contributing editor for the 'Wordsworth Editions Mystery & Supernatural' series and a major contributor of introductions to the 'Collectors' Library Editions'. So this is an author of proven ability and I enjoyed this book very much as it reminded me of similar crime books set during wartime by John Lawton. Very entertaining and recommended.